Joseph Thomas (J. T.) Reilly was born on 23 December 1836 at Richmond Barracks, Dublin. He arrived in Perth on the Pyrenees convict ship with his father Joseph Reilly, mother Catherine Reilly (nee Regan), and his brother Philip. J. T. was aged 15 at the time. J T Reilly became a prominent member of the early Western Australian community. In 1893 they family moved from Perth to Northam. He is listed on the 1901 and 1906 WA Electoral Roll as a journalist living at Gordon St in Northam. JT was a notable figure in the Perth co-operative movement and Mechanics' Institute, and Founder of the Northam Advertiser in 1893, and Catholic Record, which is still in use. The following is an extract from J. T. Reilly's book: "Reminiscences of fifty years residence in Western Australia, Perth" which was published in 1903. In it he recounts the process which he went through upon selecting a wife. It would have been a difficult objective at this time (1855), as the male to female ratio was probably of the order of ten to one. "The task of selecting a wife is not an easy one, but on a wise choice depends one's whole future. Love, as we all know, is pictured as blind, and, therefore, the inference is that there may be as much chance as previous reflection in the choice of a partner for life. But, be this as it may, I can only say that I was fortunate in my selection, and that to the advice and womanly direction of my wife I owe any success I may have achieved during my struggling career." J T married Mary Lucille Burrows on 10 April 1855 in Perth, WA. They had many children, including Charles Phillip Reilly and Mary Frances Reilly. 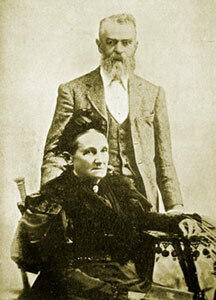 Mary Lucille died in 1902 after nearly 48 years of marriage. Not long after, J.T. married his young housekeeper Annie Fernihough (b. 1876), daughter of Samuel. Annie arrived in WA in 1881. "In loving memory of Joseph Thomas Reilly, beloved husband of Annie Reilly, born 23rd Dec 1836, died 13th Oct 1915. "Blessed are the dead who die in the Lord, And now abideth Faith, Hope and Charity, These three: But the greatest of these is Charity." Founder of the Northam Advertiser, and Catholic Record. And author of "50 Years Reminiscence of West Australia. Mary Catherine Reilly, b. 1856 in Perth, WA. Mary Ann (Ellen?) Reilly, b. 27 Jan 1859 in Perth, WA, d. 12 Dec 1937 in Albany, WA. Ursula Mary Reilly, b. 1 July 1861 in Perth, WA, d. 1940. She married Harry (Henry) R Harley, married 12 May 1896 in York, WA, b. 1861 in Victoria, (son of Nicholas Harley and Elizabeth Lane). Joseph Cuthbert Reilly, b. 1863 in Perth, WA, d. 1863 in Perth, WA. Mary Reilly, b. 1865 in Perth, WA, d. 1865 in Perth, WA. William Hugh Reilly, b. 1868 in Perth, WA, d. 1869 in Perth, WA. Alice Monica Mary Reilly, b. 1873 in Perth, WA, d. 1873 in Perth, WA. Kathleen (Catherine?) Margaret Reilly, b. 1876, d. 1961. She married Charles R Courtland, married 1898 in Northam, WA.